How Saudi Arabia Plastic Pipes and Fittings Market is Positioned? Saudi Arabia Plastic Pipes and Fittings Market is at its late growth stage. The market growth has stagnated as the decrease in oil prices has impacted the demand of plastic pipes and fittings in the country and there were not a lot of infrastructure opportunities coming up in the recent years. The market is highly correlated with the development in the infrastructural, mining and construction of new house dwellings in the country. There has been a trend of substituting PVC pipes and fittings by PE pipes and fittings in potable water distribution applications and by PPR pipes and fittings in internal plumbing application in the past few years. The water supply and sewage end use application continues to be the leading end user application in the market. The market is concentrated with few organized players dominating the market. 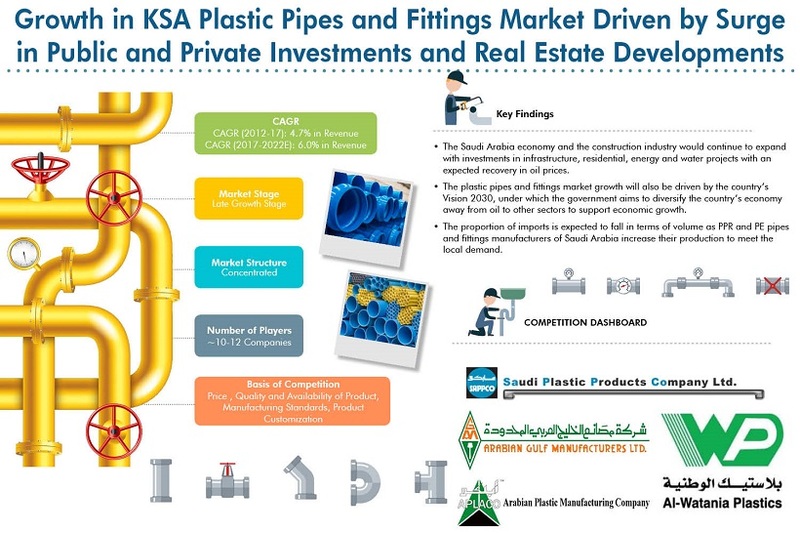 Saudi Arabia Plastic Pipes and Fittings market augmented positively from 2012 to 2017 at a positive CAGR during the review period 2012-2017. The organized sector dominates the market due to its superior product quality and enjoys competitive advantage over the unorganized sector as it can provide product customization. Government schemes such as Vision 2030 to emphasize on developing sectors such as transport and logistics, boost private sector contribution to the economy and transformation of the government’s Public Investment Fund (PIF) into a USD 2 trillion sovereign wealth fund have contributed majorly to the market. There has also been a shift in consumer preference from steel pipes to plastic pipes for various industrial uses as it is a more economical option. In 2017, UPVC pipes and fittings continued to be the most prevalent product followed by CPVC and PVC pipes, PE and others including PPR, ABS and PVDF pipes in terms of revenue in the Plastic Pipes and Fittings market in Saudi Arabia. The demand for PVC pipes and fittings has been reducing continuously because of the increase in application areas of PE and PPR pipes and changes in consumer preferences. This trend is anticipated to continue in the next five years as well. In 2017, the organized players which consist of those companies which have their own production capacity in the country and can produce in huge volumes occupied a major market share in terms of revenue in the overall market. This is because the big organized players enjoyed competitive advantage over small unorganized players on the basis of product customization, availability of credit facility, product innovation and better quality products. In 2017, Water supply and Sewage contributed the highest share to the Plastic Pipes and Fittings market of Saudi Arabia. This was because of the new construction activities, real estate development and also the alteration, conversion and renovation activities on-going in the country. This was followed by the plumbing sector, other applications such as oil and gas transmission, cable protection, healthcare and automotive industries, chemical and oil industries and Irrigation in terms of revenue. Saudi Arabia plastic pipes and fittings market is concentrated with the presence of few big players constituting majority of the market. Saudi Plastic Products Company Ltd (SAPPCO), Saudi Basic Industries Corporation (SABIC), New Products Industries Co Ltd. (NEPROPLAST), Arabian Gulf Manufacturers Ltd (AGM), Al Watania Plastics, Munir Munif Plastic Factory (MMP) and Almona Plastic Product Company Ltd. Co. are the major players in the market. These big and established players compete with the other unorganized players on the basis of product customization, availability of credit facility, better information about the various products in the market, product innovation and better quality products. The future outlook of the industry is positive because as the oil prices are expected to recover in the coming years, it will give a boost to the Saudi Arabia economy and the construction industry would continue to expand with investments in infrastructure, residential, water and energy projects being the growth drivers. The plastic pipes and fittings market growth will also be driven by the country’s Vision 2030, under which the government aims to diversify the country’s economy away from oil and support economic growth. The transition in the preference for plastic type is set to reduce the market of PVC pipes and fittings and consequently increase the market of PE and PPR pipes by FY’2022 in terms of revenue. It is estimated that water supply and sewage sector will still contribute the highest share to the revenue of plastic pipes and fittings in Saudi Arabia as of FY’2022. As PPR and PE pipes and fittings manufacturers in the country increase their production and are able to satisfy the local demand, the proportion of imports are expected to fall in terms of volume.